Phil Morris (Saskatoon, Toronto, NYC, Canada) on 10 January 2013 in Art & Design and Portfolio. Lovely close-up of this exquisite piece! Yes, as Stephen said, it's such an exquisite piece. I just love the careful atenttion to detail in the bronze figures. A marvelous piece to have in your collection, Phil. Two very handsome tables, I'd be too scared to use them! belle table !! très ornée !! I am so impressed with the intricate detail...an exquisite piece. Everything is beautiful on this piece, right down to the grain of wood and that exceptional lathe work on the pillar. This is going to be ultra gorgeous when you top it off with the marble ! The details are just fabulous! You are quite a collector of fine things! Wow, this is so beautiful. The bronze ladies are quite elegant. 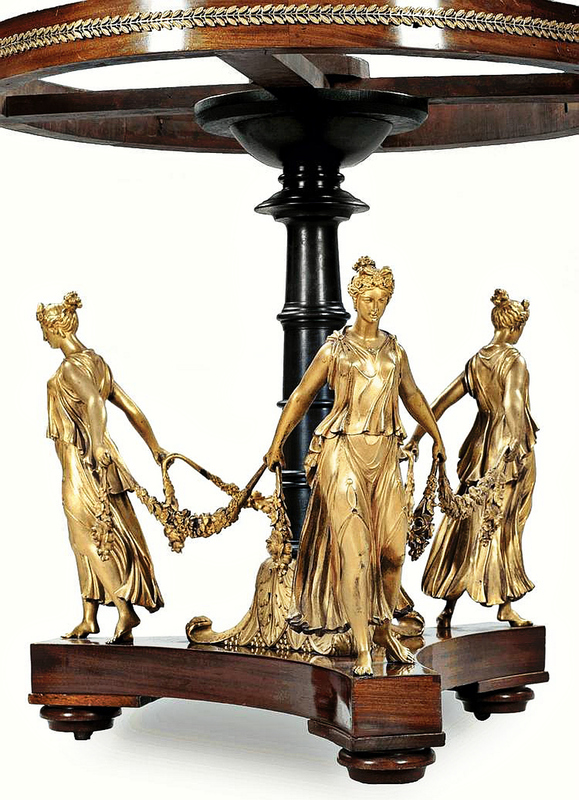 I was thinking maybe a glass top with a bevelled edge then you could view the bronze ladies. However glass may not be an appropriate top for this table. A beautiful table, which would look very nice in my living room. You have photographed these last two pieces of furniture really well with the pleasing lighting and background - it isn't easy to do that. wow - what a beaut! You have great taste!